I like to teach Go to new players, since it gives me a chance to examine my own play habits. As far as my own development is concerned, I've been playing more territorially of late. I like to get some money in the bank and then go for blood. For more, go to the blog. Questions, comments or sugesstions relating to anything I do at Sensei's should probably go in my discussion section. But if you wanna plaster them all over my page just be considerate of what I've already written here. Since I initially did a fair amount of my Go study in a vacuum (I'm a teach myself kind of person), I have a hankering for go books and information--hence the obsession with SL. Reading fills the time between games quite well, and since I absorb more readily than memorize, I don't think I let rote knowledge get in the way of my play. 38 Basic Joseki - I am trying to resume my joseki study. I've been burned by some misunderstandings around the 4-4 point. While I originally thought that they'd be unuseful in the mid-kyu ranks, I've come to realize that I'll need to have a better knowledge of joseki to break into the SDK range. Invincible - I don't understand it yet, but it's awesome. The Chinese Open: A Sure-Win Strategy - Just started. Like it. 1001 Life and Death Problems Vol. 2 - I'm working on this one during my free time. The first forty problems were a nice confidence boost. We'll see how the rest of the book goes. Strength training. Pure and simple. These are the things you should really learn as fast as possible. In the case of the vocabulary, you don't really need to understand all the aspects of the term. Instead, you should know what each term describes when it is mentioned (especially in the case of "territory" and "influence"). Know the general principles of Opening Theory including the difference between the fourth line and the third line. Also, be familiar with the concept of bases. There are also some joseki that you should know out of the gate because they are quite useful in many simple opening situations. These can be found on my consolidation page along with some basic suji that can be learned quickly and will save your skin a lot. Some familiarity with extensions will help you learn to stake out territory. 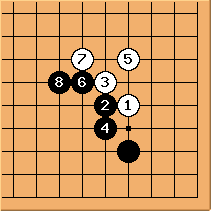 sjd123: You should be careful learning too much joseki, it could make you weaker. When you learn some joskei, don't just learn it but understand why to play there. I'm 9k, and I know only 2 josekis. You should focus more on playing and studying things like tesuji and doing some tsumego. A good book would be lessons in the fundamentals of go. Anyway, good luck!